Carrera marble water fountain by French sculptor Sylvain Salliere. View shows back of the sculpture looking east along Park Royal store fronts. 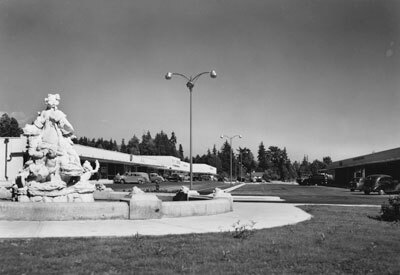 This photo, part of a series by Williams Brothers taken c. Aug.1950, appeared in an advertisement for the British Properties in the Vancouver News Herald on May 28, 1954. Scanned July 2011 using Epson Perfection V700 Photo at 300dpi and 100% of original image size. Alternate Versions: Lossless TIF from original scan at 300dpi and 100% of original print. W24 x H17 cm black & white print on photo paper.